Please [Contact Us] for any product that does not have a listed price. Prices shown include IVA unless otherwise stated. Click on a product image to show the image larger. I just wanted to drop you a quick line to thank you for doing such a great job, the table looks fantastic. I cannot tell you how refreshing it is to meet someone who runs their business professionally and efficiently here. Thanks for the work you did on the table, it plays great now it is level and the new cloth was definately worth having done, shes not happy though as i've been on the table every spare moment I can get lol. Great experience working with you, I will certainly recommend your company in future. Just a short note to let you know how delighted I was with the work you did erecting the snooker table. All I need now is the time to use and enjoy it! 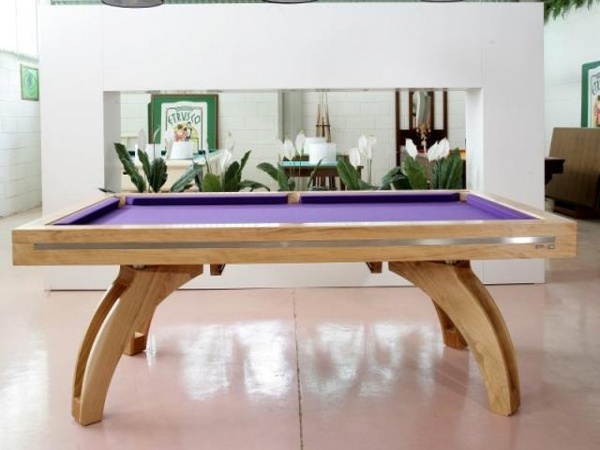 Heywood Supreme English 7' home pool table in Walnut coloured finish. Heywood Supreme Slimline, these pool tables are manufactured to the highest of standards. The Slimline tables are made from a laminated MDF body and top frame, the table has a... slate bed and is covered in top quality cloth. 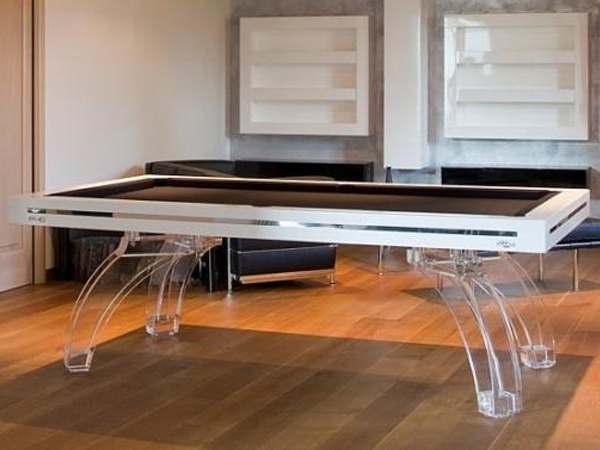 This is the home pool table of the Supreme range and is by order only. Delivery for this item can take between 2 and 4 weeks relative to the time of the year. The price shown does not include fitting nor delivery from Fuengirola, this is relative to your location. As a guide: A price for delivery and fitting in Marbella area would be approximately 120 Euros + IVA. We import direct from the UK manufacturer. Note: The price shown is for an order of up to 5 tables, if more than this is needed then we can make a reduction in the unit price because of transport savings. The price shown is for pick up from our stores in Fuengirola. Green, Red, Blue, Burgandy, Black, Purple and Tan. 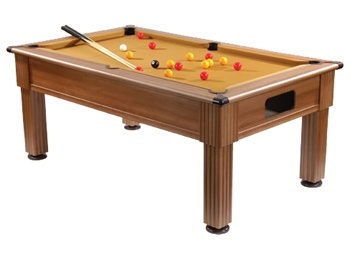 Heywood Supreme English 7' home pool table in Beech coloured finish. The Slimline range of tables are made from a laminated MDF body and top frame, the ... tablehas a slate bed and is covered in top quality cloth. 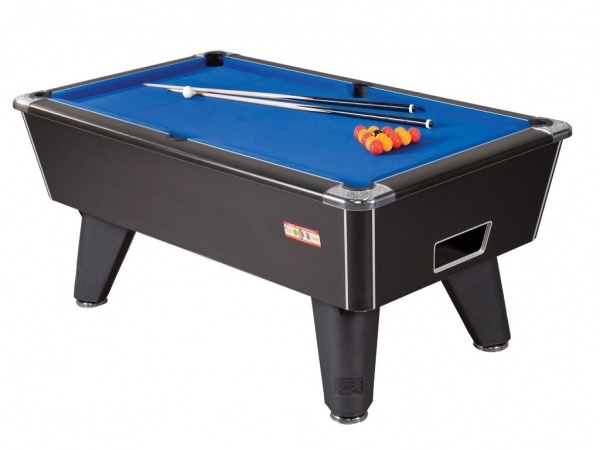 Winner Freeplay English pool table 7' in Black colour (As photo) with slate bed. This table can be supplied with Green, Red, Burgandy, Purple Black or Blue cloth as in the photo. This price includes ground floor fitting within 20 K of Fuengirola, a small surcharge will be made for places further afield. The P40 has a sleek unassuming design, and great playing characteristics. The table in this image is in Walnut with 4 walnut legs. 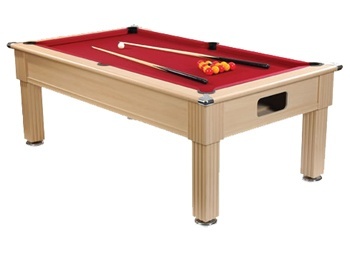 This is one of the finest range of solid wood pool tables available in the market at present. It comes in five... different sizes ranging from 7ft to 12ft. The 8.2ft version offers the choice of 4 or 6 legs, depending upon your preference. The 8.5ft, 9.3ft, and 9.5ft tables come with 6 legs as standard. The 9.8ft, 10ft, 10.7ft and 12ft tables all have 8 legs. These tables are made from solid wood. The legs are available in a choice of types and designs, comprising of raw oxidised steel, stainless steel, plexiglass, carbon fibre style finish, and of course matching solid wood. You can even specify that the balls, once potted, fall into steel trays protected with transparent film, this is available as an optional extra. As standard the table is fitted with matching leather pockets. 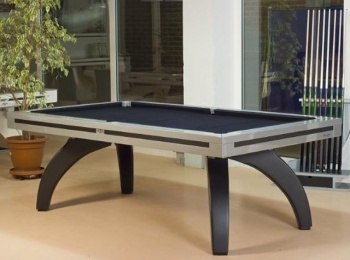 The slate is 100% Italian and the cushions are tournament grade, made from Artemis rubber which is made in Germany. This table is supplied with or without a dining top. Should you decide to have a dining top you can choose between wood, glass and plexiglass. 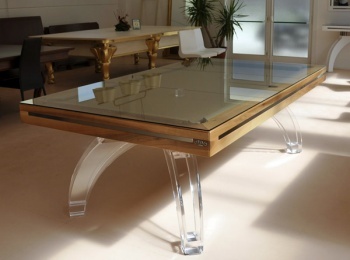 The price of the dining top depends on the table size, a dining top for the 7' table is €1,200 inclusive of IVA. # American Pool Balls: 2 1/4 inch Spots and Stripes or 2 inch English Pool Balls for the English version of the table. # Leg number: 4 (Any standard available leg type is included in this price). # Delivery time: Approximately 35 days from payment. The price includes delivery and installation on the ground floor within 25k of Fuengirola, enquire if you are unsure. Please contact us for a written quotation, these tables are available with several different combination options which can alter the price from that shown. The table in this image is white with 4 perspex legs. It is one of the finest range of solid wood pool tables available in the market at present. It comes in five different... sizes ranging from 7ft to 12ft. The 8.2ft version offers the choice of 4 or 6 legs, depending upon your preference. The 8.5ft, 9.3ft, and 9.5ft tables come with 6 legs as standard. The 9.8ft, 10ft, 10.7ft and 12ft tables all have 8 legs. This table is supplied with or without a dining top. Should you decide to have a dining top you can choose between wood, glass and plexiglass. The price of the dining top depends on the table size, a dining top for the 7' table is €1,210 inclusive of IVA. The table in this reference is silver coloured with 4 carbon colour legs and no dining top. It is one of the finest range of solid wood pool tables available in the market... at present. It comes in five different sizes ranging from 7ft to 12ft. The 8.2ft version offers the choice of 4 or 6 legs, depending upon your preference. The 8.5ft, 9.3ft, and 9.5ft tables come with 6 legs as standard. The 9.8ft, 10ft, 10.7ft and 12ft tables all have 8 legs. This table is supplied with or without a dining top. Should you decide to have a dining top you can choose between wood, glass and plexiglass. The price of the dining top depends on the table size, a dining top for the 8' table is €1,210 inclusive of IVA. The table in this image is Walnut with 4 plexiglass legs and a 3 piece glass dining top. 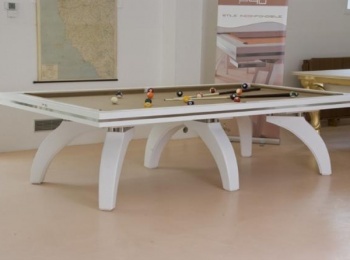 It is one of the finest range of solid wood pool tables available in the market at... present. It comes in five different sizes ranging from 7ft to 12ft. The 8.2ft version offers the choice of 4 or 6 legs, depending upon your preference. The 8.5ft, 9.3ft, and 9.5ft tables come with 6 legs as standard. The 9.8ft, 10ft, 10.7ft and 12ft tables all have 8 legs. This table is supplied with or without a dining top. Should you decide to have a dining top you can choose between wood, glass and plexiglass. The price of the dining top depends on the table size, a dining top for the 8' table is €1,210 inclusive of IVA, the price of this reference has the dining top included in the price. 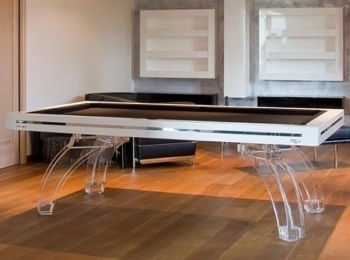 # Glass, perspex or wooden dining top. It is one of the finest range of solid wood pool tables available in the market at present. It comes in five different sizes ranging from 7ft to 12ft. The 8.2ft version... offers the choice of 4 or 6 legs, depending upon your preference. The 8.5ft, 9.3ft, and 9.5ft tables come with 6 legs as standard. The 9.8ft, 10ft, 10.7ft and 12ft tables all have 8 legs. This table is supplied with or without a dining top. Should you decide to have a dining top you can choose between wood, glass and plexiglass. The price of the dining top depends on the table size, a dining top for the 7' table is €1,550 inclusive of IVA. # Leg number: 6 (Any standard available leg type is included in this price).